Ok wanted to get a fishing report out to let everyone know that we survived hurricane Irma and Lake Okeechobee is just fine. Now we do have some elevated water levels but they are dumping it out of the lake about as fast as they can. The water level today is 17.16 feet above sea level and even though that is high we have been catching plenty of bass and there is a lot of new places to fish. We did not lose to much vegetation even though right now a lot of it is covered with water, and we do have some dirty water in some areas for the most part the lake is pretty good and I am looking forward to a great season here on Okeechobee. I have been out quite a few days since the hurricane and have done really well on live bait and I have been getting reports of good numbers being caught on artificial lures. The key for the next few months will be to look for clean water and there is still plenty out there. Check the weather forecast for the wind direction and try and fish areas that are protected from the wind. Areas like South Bay, Pelican Bay, Grass, Ritta Island, and up around the shoal have all been producing bass. We are still in our summer pattern here but fall is coming fast and so will the bass be on the move toward shallower spawning areas. With the water levels being up there will be new areas to fish this year that haven’t seen a boat for years. For artificial lure fishing I would suggest moving baits like spinnerbaits, swim jigs, lipless and shallow running crankbaits. If fishing with wild shiners is your favorite way to catch bass I suggest looking for clean to stained water and throw some shiners up against any heavy vegetation like floating mats or lily pads. We all have a new lake to learn to fish with the higher water so if your traditional areas that you have fished for years aren’t working try somewhere new. You will get to see some areas of the lake that you haven’t seen since 2006, so get out there and look around. I have not received and reports on crappie yet but the snowbirds are starting to show up here on Okeechobee and I should have a report soon. Now is the time to get those fishing trips booked as dates are filling up fast. Don’t miss out on this opportunity to see and fish some new areas of Lake Okeechobee. It is that time again to move on to a new boat. My Ranger is for sale and is in great shape and has a lot more years of fishing left in her. Carpet and seats are in great shape and it is ready to go fishing. Are you ready to get out of the cold snowy north and catch some bass? Well then Lake Okeechobee is the place to be to get out of the cold and catch some giant bass and enjoy some warm sun. The bass are on the move toward spawning areas and we have been catching some really nice big bass here on the Big lake, and it will only get better as we move into February and March. It has been a really good season so far here on Okeechobee and it seem to be getting better almost daily. We have had a couple cold fronts that slowed it down for a day or two but then we are right back to catching them good. The water level is around fourteen feet above sea level and in my opinion that is just about right for this time of the year. I have been fishing from up around Cochran’s Pass to Pelican Bay with the wind being the deciding factor as to where I go. The main concentration of bass still seem to be on that outside grass line close to open water but when the wind really blows moving back in till you find clean water and you will find the bass too. These bass on the outsides are fresh bass moving in off the main lake headed toward traditional spawning areas so be ready for this bite to start happening. The bite on wild shiners has been crazy on most days and five dozen shiners usually only last for three to four hours and then it is off to catch some on artificial lures. The bite on artificial lures has picked up some as more and more bass move in to spawning areas throughout most of the lake. The Gambler Ace stick bait has been my choice for soft plastic lures and a lipless crankbait has been my choice for hard baits. We should start getting a good bite pitching craw type baits into reed heads soon and that is one of my favorite ways to catch big bass, the Gambler Why Not is my choice of baits to fish this way. For all my northern friends be sure and come armed to catch and get these Lake Okeechobee bass out of the heavy grass. I prefer a heavy action rod and braided line at least in that fifty pound test range. I have been testing some TFO rods in the Pacemaker line and they are defiantly the stick to get the job done here on Okeechobee. The crappie bite has been pretty good from the reports I have been getting and areas north of Uncle Joe’s cut, around Bird Island, and the rim canal have been the areas that have been producing here on the south end of the lake. Jigging and minnows are both working. Now is the time to be on Lake Okeechobee catching bass, we do catch bass year round but now through May is the best chance to catch that once in a lifetime fish. 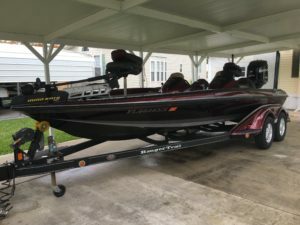 Couple of tips for out of state boaters new to Okeechobee, we have a lot of boat trails in the grass and I would like to stress they are boat trails not fishing trails. Fishing in these trails is a good way to get run over and we don’t want to see anyone get hurt here. The other thing is just courteous among fishermen out there on the lake; treat everyone like you would want to be treated and I think we all would get along just fine out there on the water. Until next report good luck, tight lines, and I hope to see everyone on the water soon. December is here and that means it is time to get ready for the Christmas holidays but here on Lake Okeechobee we will be getting ready for spawning bass to be on the move toward the shallow water spawning areas. Now that the water has finally cooled off and the water level is below fifteen feet above sea level everything is getting right for another great season here on Okeechobee. We are really starting to see a good number of fish moving in off the main lake to areas that we typically fish though the winter months. Areas like East Wall, Rita Island, Long Point, Grassy, and Pelican Bay are all starting to get really good and will be good fishing though the spring here on Okeechobee. The artificial bite has been improving almost daily with good numbers being caught on worms and swim jigs. Pitching jigs and craw type baits to reed heads and thicker mats have been producing bigger fish. The live bait bite with wild shiners has been great and will continue to produce big numbers and big bass throughout the season. We are typically using 5 to 6 dozen shiners on a six hour charter and usually still have time to cast some artificial lures for an hour or so. I like to start my day out throwing some topwater swimbaits like a Gambler EZ Swimmer in the hay field areas that are closest to the open water lake but still have clean water qualities, I will then keep moving back in the thicker grass areas as long as I am still catching bass. If you get back in to far off the main lake sometimes the water quality will sometimes start to deteriorate from lake of oxygen in the area, usually you will smell the dying vegetation. If you try to stay in good clean water as close to the open water part of the lake you can’t go wrong. As far as lures what I have been using lately is Gambler EZ Swimmers in junebug and ice breaker colors, Gambler Ace and Super Studs in junebug and watermelon-red, and a 10” Charlie’s Worm in black or junebug color. The bite on artificial lures has been all over the place so don’t be afraid to try any of your favorite lures. I like to start the day out fishing lighter colored lures but as the sun gets up higher in the sky I move to darker colored lures with junebug being my favorite color here on Okeechobee. With Christmas just around the corner a fishing trip for your favorite fisherman is a great gift. Now is the time to be sure and get a trip book soon as dates are filling up fast along with motel rooms, it is going to be a great season here on Okeechobee and you won’t want to miss out on it. Don’t forget to check out Roland Martin’s Marina for all you fishing needs including boat rentals, hotel rooms, camping, and all your fishing tackle needs. I will have gift certificates available for that hard to shop for fisherperson in your life. I just want to wish everyone a very Merry and Blessed Christmas and I hope to see everyone on the water soon.